Ireland is an island located in the eastern part of the North Atlantic Ocean, west of United Kingdom. The capital of Ireland - Dublin is situated on the Irish Sea coast. The country is rich with heritage centers which reveal the cultural, political, geographic and social history of this island. Vacation to Ireland or 'Emerald Isle' promises hauntingly beautiful Irish gardens, grandeur of old castles and romantic ruins. Dublin is fast emerging into a city of excellence for innovation and creativity as a 'Digital Hub' for research and learning for the media industry. Several top notch companies have found their home in Dublin. Grange Castle in the Dublin suburb is the locale for the largest international bio pharmaceutical facility in the world. Apart from its high technology associations, Dublin is renowned for its architectural significance. This cosmopolitan metropolis combines the effects of the earliest Viking settlements to the Georgian squares. It is home to writers of fame such as Joyce, Beckett, Synge and Wilde. Dublin surrounded by the Dublin and Wicklow Hills and the Dublin Bay affords full scope for outdoor and leisure pursuits for the tourists. Ireland is synonymous with legendary castles, stately homes and ancient monuments. Ireland owes its Castles to the Normans who transformed the Irish Landscape in the twelfth century. Ireland is dotted with monuments from the past. The Trim Castle in County Meath is one of the largest of castles. The Dunluce Castle in County Antrim is spectacular and is reputed to be the inspiration for the famous castle 'Cair Paravel' in CS Lewis 'Chronicle of Narnia'. The Carrickfergus Castle in County and Enniskillen Castle beside the river Erne are steeped in history. The Dromoland castle, Castle Leslie and the Ashford Castle speak tales of horror and bloodshed. The Megalithic passages tomb at Newgrange in County Meath is a UNESCO World Heritage Site. It draws over 200,000 visitors every year. This dramatic mound surrounded by kerbstones is decorated with fine megalithic art. The Beaghmore Stones in County Tyrone date back approximately 1500 BC. It consists of seven stone circles associated with legendary astronomical observations of lunar, solar and stellar events. The Great Mound at Knowth built around 5000 years ago has to be accessed by a guided tour. The Kells is a stunning round tower built for protection of the Vikings. It still remains where it was created over a thousand years ago. And not to miss is the Navan Fort in County Armagh, which was the seat of the Kings of Ulster. This fort interprets an important ancient monument and draws the tourists to an understanding of the diverse history of Ireland. Cobh - the Queenstown story is a fascinating multimedia exhibition which retraces the steps of the two and a half million people who emigrated from the port of Cobh in Cork. The Burren: This limestone plateau often compared to a moonscape has ancient monuments and bizarre rock formations. Situated in County Clare, Burren has some excellent flora and fauna including sheets of gold and cream Arctic-alpine and twenty two varieties of orchids. Bru na Boinne: This historic landscape which is located on the banks of the river Boyne is full of prehistoric monuments. Newgrange and Knowth are famous but offer restricted visiting permission. 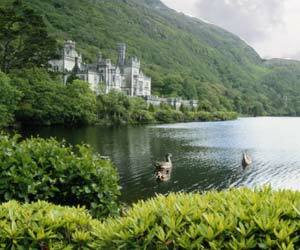 Lakes of Killarney and Ring of Kerry: The tranquil old world charm can be felt in Killarney's lakes, castles and houses. Thousand of tourists throng this place to experience spectacular scenery, breathtaking landscapes and ancient monuments. Glendalough: Simply beautiful in its setting beside a valley and lake, St. Kevin's Kitchen and cathedral are for architecture and history lovers. The Giant's Causeway: This is Northern Ireland's first World Heritage Site. The tourist has to see the fine stretch of rock which is a spectacular geographical phenomenon. Cliffs of Moher: The cliff ends more than 650 feet straight down into the Atlantic, a visibly daunting sight indeed! This is no doubt one of the spectacular coastal areas in Europe and a tourist will be awestruck at the undulating landscape. Sligo and Area: This place is overwhelming for the tourist with an amazing sight to enjoy at the end of a steep climb. Carrowmore is the largest Stone Age cemetery in Ireland. The grave of W.B.Yeats is next to the spectacular table mountain of Ben Bulben. The Mourne Mountain: This range is renowned for its outstanding natural beauty. There are about twelve peaks in this range and the region's highest mountain is Slieve Donard over 500 meters high. Cycling: There are lots of winding routes for cycling, tiny tree-lined lanes and quiet rural roads. There are four high quality signed cycle routes in the National Cycle network in Ireland. Golfing: The stunning array of rivers and lakes in Ireland make for some of the most beautiful golf course. The mountains with cliff top forests and seascapes are all open for the golfing community. Infact 30% of the world's links courses are in Ireland. Fishing: Ireland is one of the most popular destinations in Europe for fishing. This country has earned an enviable reputation for its fishing quality and variety. There are plenty of locations for fishing and the ratio of water to land is 1:35. The climatic conditions of Ireland are fish prone with temperate summers, mild winters and moderate rainfall throughout the year. Equestrian: Ireland is also known as 'the land of the horse'. Ireland offers a 'riding holiday' in the real sense of the term. Walking: You can opt for walks in Ireland with exciting themes - Island walking, Mountain walking, moorland walking, historical walking, archeological walking and mythological walking. Walkers who find a relaxed walking pace in rural Ireland can interact with local communities and savor the life and times of Ireland. Ireland is also famous for its walking festivals. These walks during festivals vary in distance and duration and there are all types of walks in all types of terrains to suit all abilities of walkers. It should be a truly unique and memorable experience for the tourist. Climbing: Irish mountains are low in height but are steep enough to pose a challenge to the climbers. The thrill of climbing the rough terrain in the unpredictable weather could make this island a climbing paradise. Sports: Ireland is famous for its rugby competitions. The entire nation goes wild singing the Irish national anthem when a match is on. Spring is the perfect time for a rugby match. Hurling is a furious sport. The passion with which the Irish support the hurling match is infectious. Croke Park is the best place to see hurling. Gaelic football is the Irish version of football but with a speedy tempo. Camogie is the indigenous sports of Ireland and it is the ladies version of hurling game. The Annes Grove in County Cork is famous for its exotic bamboos and gigantic leaved gunnera. The Belvedere in County Westmouth has picturesque landscapes on a 160 acre land. The Butterstream in County Meath offers neatly hedged enclosures and mossy urns. The Kylemore Abbey in Connemara is beautifully manicured with six acre garden. The National Botanic Gardens in Dublin has house plants from all over the world with finest collections of vineries, tender rhododendrons from Southeast Asia. Mount Steward in County Down offers great diversity of style and plants from every continent of envious character. Aran Sweaters: This is traditional knitwear from the Aran Islands and has 'family patterns'. Tweeds: It will never go out of style. Crystal: Irish crystals are produced in several factories and outlets that are of fine quality. Linen can be bought in factory outlets, craft stores, designer outlets selling from tea towels to 'grandfather shirts'. Irish whiskey is available in all price categories according to quality. Direct purchase can be had from distillery like Bushmills. Parian China can be bought singly or in a set from Belleek. Irish Music may be found all over the world, but one can look for local artists DVDs. First Published Date: Feb 17 2007 Last modified Date: April 25 2019 This page may have been updated recently as new information is available or the content may have been edited for better readability.